It’s only so often that you get to see geology in the making, and this is a remarkable event indeed. Volcanologists studying an undersea volcano erupting near the island of El Hierro announced that the volcano, which is located at just 70 meters below sea level, will probably create a new island. 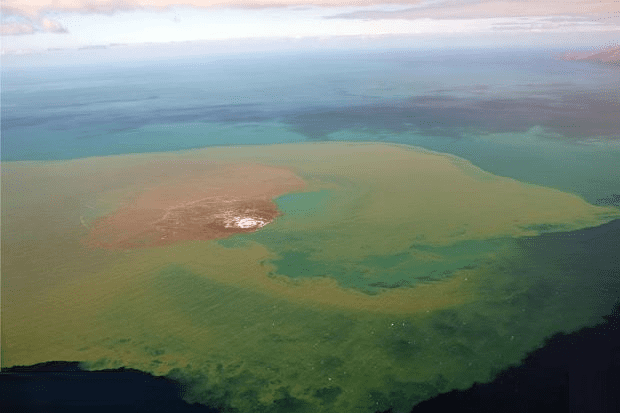 Over the past couple of weeks, volcanic activity off the Canary islands has caused jets of water to rise even some 20 meters above sea level, and locals claim to have seen rocks being thrown out of the water as well. After science stepped in, it was revealed that the water in the area was significantly warmer than surrounding sea, and the culprit was, as expected, what is called the Canarian hotspot. Hotspots are remarkable volcanic regions where the mantle is much hotter than normal, and closer to the surface than usual. Aside from this region, other remarkable examples are the Hawaiian islands and the Yellowstone volcano. Since July 2011, over 10.000 small earthquakes shook the island of El Hierro; however, since October, they have become more powerful (though not very dangerous), at over 4 degrees on the Richter scale. The main problem was caused by the supherous gases that were released by these temblors. However, an interesting phenomena occurred: the earthquakes moved towards to the north, and rose upwards, closer to the surface. However, at the moment, there is no imminent danger of eruption, so residents of El Hierro have already started thinking up names for the new territory.